Pergolas are a lovely combination of open and enclosed space, creating and defining a sheltering landscape. Pergolas can be built from kits or by using a set of plans. Traditionally, they are constructed of wood, with cedar a popular choice, but metal or vinyl also can be used. Pergolas can be attached to the house, may enclose a patio, or can be built as a standalone structure in the garden. The cost of a pergola depends on the size and complexity of desired accessories. Pergolas can be outfitted with a trellis or lattice panels for plantings; chairs, benches, swings or other seating; and even lights. A rustic, old-world look is most common, but today there are many with a modern profile—that is, clean lines and sculptural appeal. It is interesting how a chance comment can cause you to pay attention to a garden design feature you had not previously noticed. Several weeks ago I was chatting with noted landscape architect Edmund D. Hollander about his new book The Private Oasis: The Landscape Architecture and Gardens of Edmund Hollander Design (see previous post here), and he mentioned clients’ growing interest in pergolas. Since then, it seems that I’ve been seeing these sheltering structures in a variety of both public and private spaces. Pergolas are a fascinating hybrid of open and enclosed space. They can be either freestanding or attached to existing buildings; in some cases they are used to affect a transition between a home and yard, patio or pool. The simplest styles consist of several upright, vertical posts or pillars used to support a series of overhead joists or crossbeams. 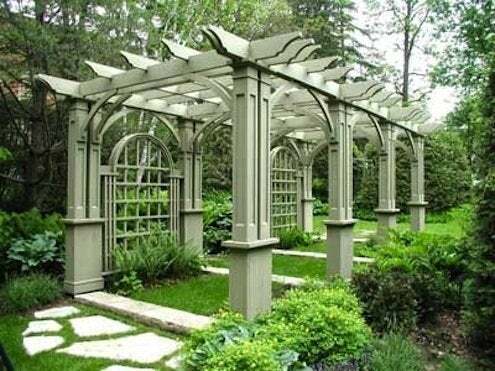 Often flowering vines or greenery are trained to grow up and around the posts to create a shady arbor, and lattice panels may be added to the sides for an aura of mystery and privacy. Originally designed as projecting eaves, pergolas have a rich history dating from the gardens of 17th-century Italy, where they evolved from popular ‘greenways’—woody vines fastening woody together to form arches or tunnels. Pergolas fell out of design favor in the 18th and 19th centuries but are now making a comeback as modern homeowners seek outdoor options with personality and design flair. Pergolas can be constructed in a variety of ways using myriad materials, but given that they are completely exposed to the elements, durability is a priority consideration. Stone or brick posts topped with weather-resistant wood (cedar, redwood, pressure-treated pine) or vinyl crossbeams are common in pergola construction. In order to blend in better with the landscape, pergolas’ wood components are often left to weather naturally, though of course they can also can be stained or painted. 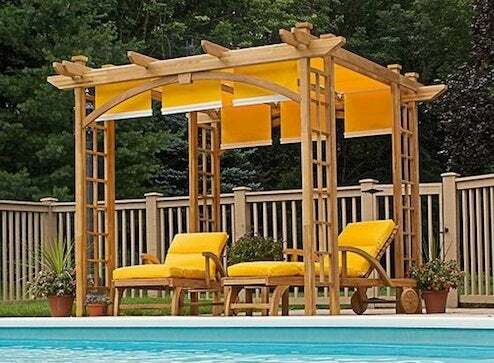 Many local builders and national home improvement chains offer pergola building kits in addition to decorative options, such as ornamental caps for the posts and beams, canopies, and outdoor lighting elements. Adding climbing plants such as wisteria, grapevines, hydrangea, clematis, roses or trumpet vines provides the ultimate outdoor accent for your personalized private getaway. Now if only I had more space in my backyard….